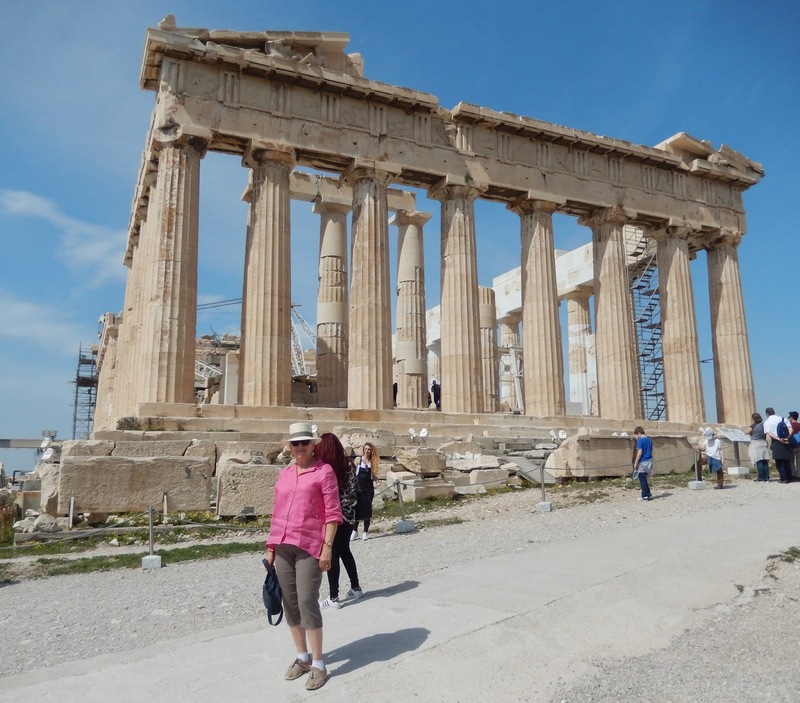 The Greek flag flutters proudly on the Acropolis. 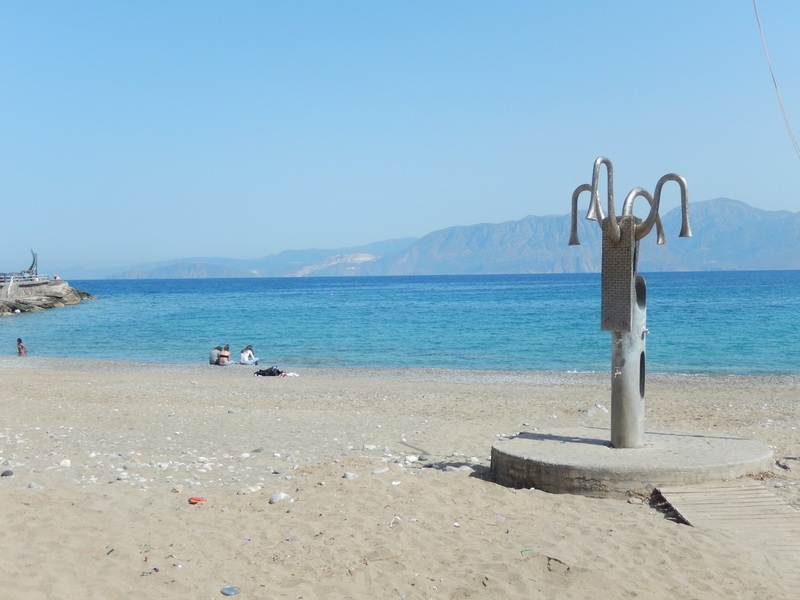 The second half of our Easter break was spent entirely in Greece. 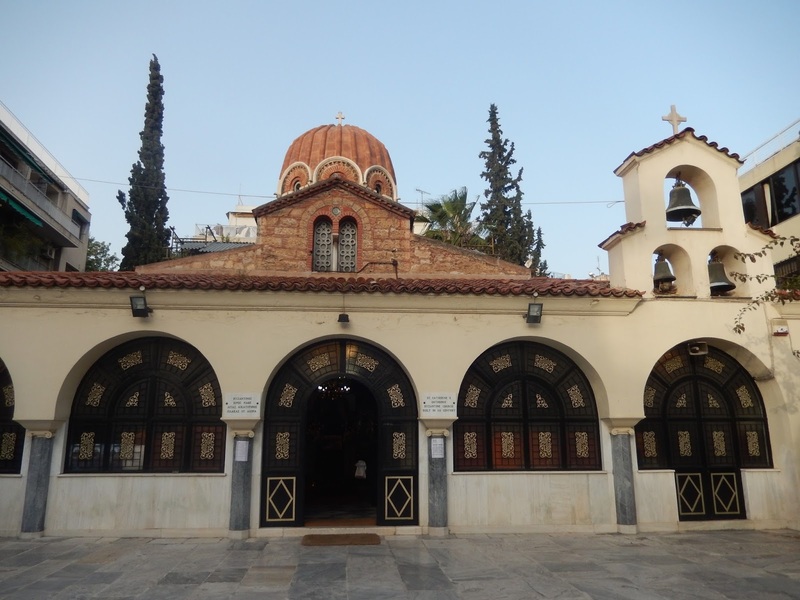 We began and ended the week in Athens, spending the middle days on Crete which we accessed and left by overnight ferry. This was the same plan as last year. Below are the blog posts I wrote in May of 2015. I will provide different photos and impressions this time around. Last year, our first full day in Athens coincided with Greek Easter, but this time that did not happen. Hence, we were able to visit the Acropolis the morning after our arrival. Our guide, Alekka, the same one I had last year, was a font of knowledge about this special area. For instance, I discovered that the word Acropolis means "a fortified area on a hill" and that the famous spot in Athens was one of many such sites in Ancient Greece. It is, of course, a very special area, since it is so well preserved, and it was the largest. 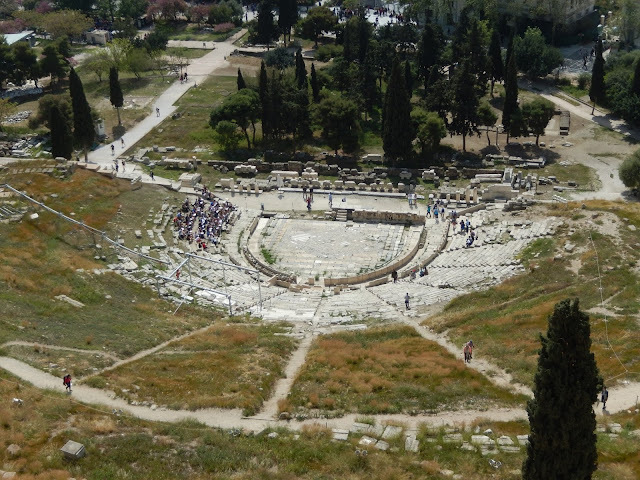 From the heights of the Acropolis, Alekka led us to the wall facing south where we were treated to a spectacular view of the Theatre of Dionysus below, and of the Temple of Zeus in the distance. 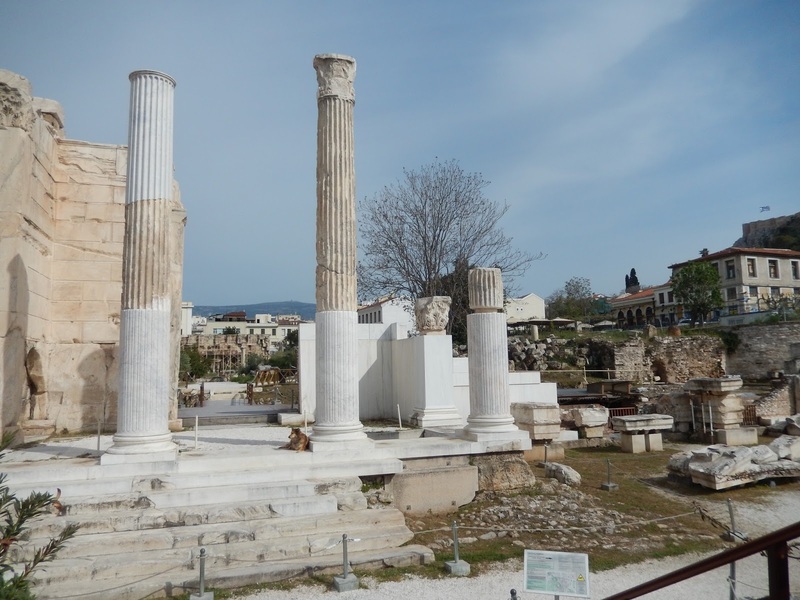 I would have liked to have visited both of these sites while in Athens, but time did not allow me to do so. 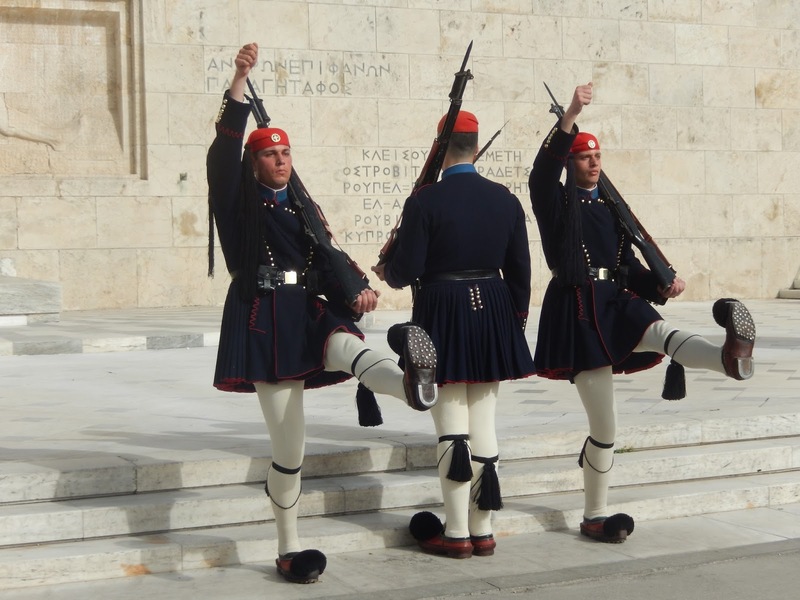 Three Evzones (guards) on their way to the changing of the guard. 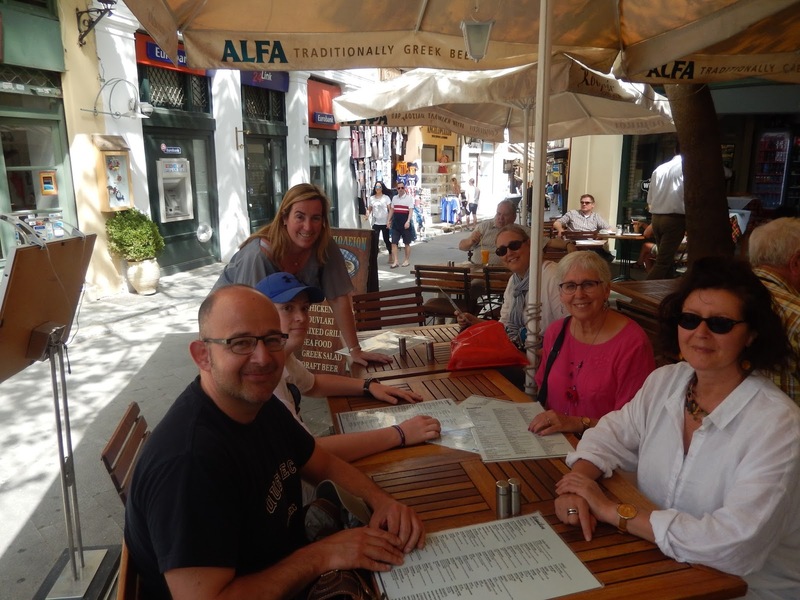 Below the hill, we grabbed a light lunch before heading off to the Museum of Archaeology in another part of the city. 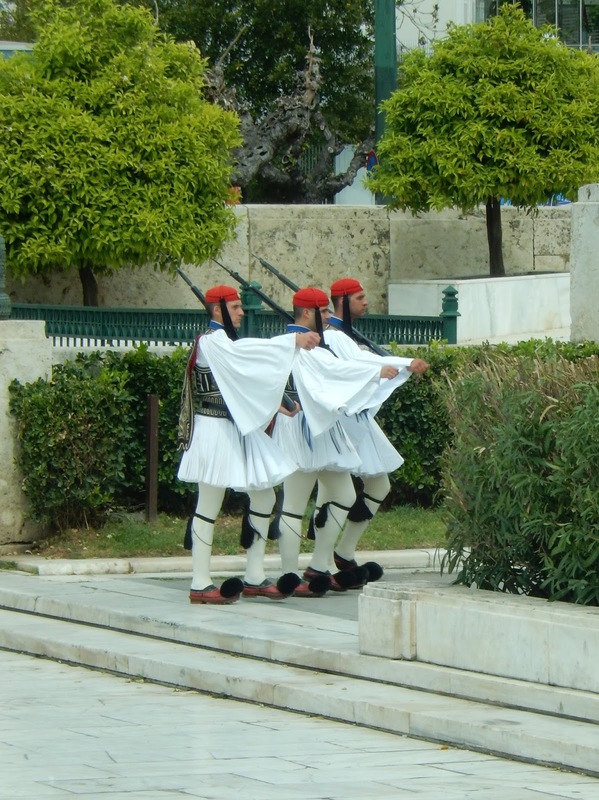 On the way, I caught a glimpse of three members of the Presidential Guard, dressed in traditional Greek attire. This tweaked my interest and I resolved to return to this spot on my last day in the city. 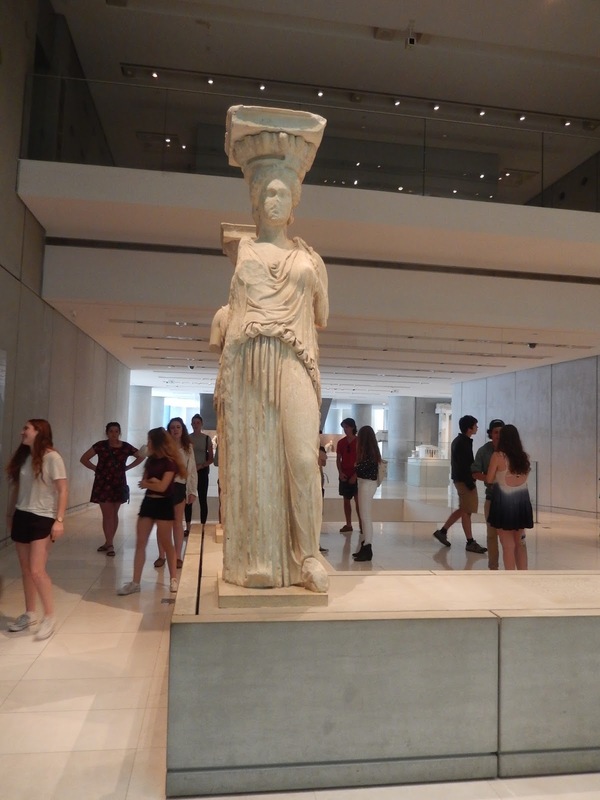 I am sorry to say that most of our students did not fully appreciate the treasures in the Museum of Archaeology. Oftentimes, it seemed that Alekka was giving me a private tour. I suppose that ancient artifacts are not for everyone. We had some free time before dinner, which we spent exploring the neighbourhood near our restaurant. In our wanderings, we came across the Roman Agora, a ruin from that later empire, and a reminder of the extensive history of Athens. 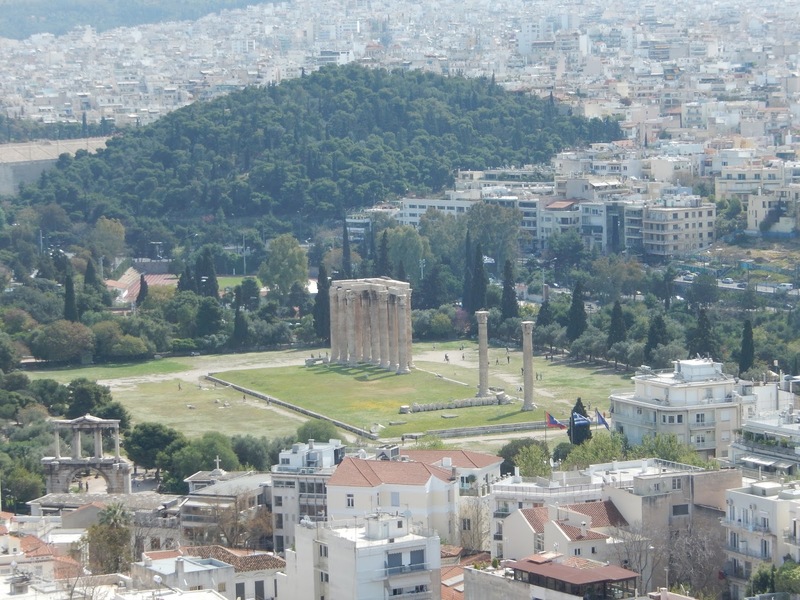 This is a city that has been occupied by many other countries over the centuries. 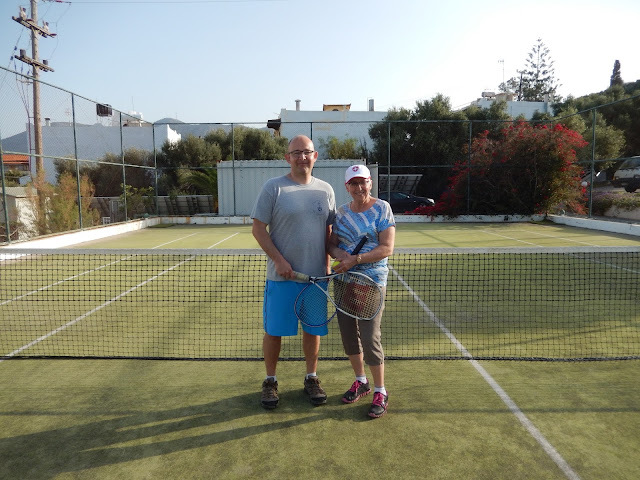 Adam and I fit in some tennis on our free day. After a busy day in Athens and a restless sleep for some (but not for me) on the ferry to Crete, we had scheduled a free day at our resort, the Hersonissos Maris, where we would spend the next three nights. 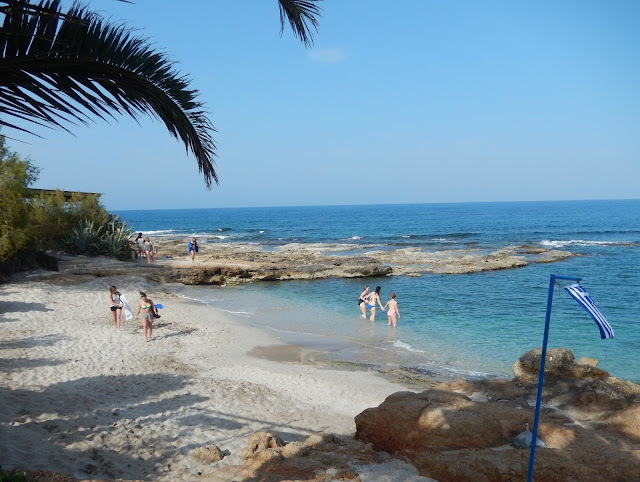 The students headed for the beach, while some of staff walked into the town, about 20 minutes away. 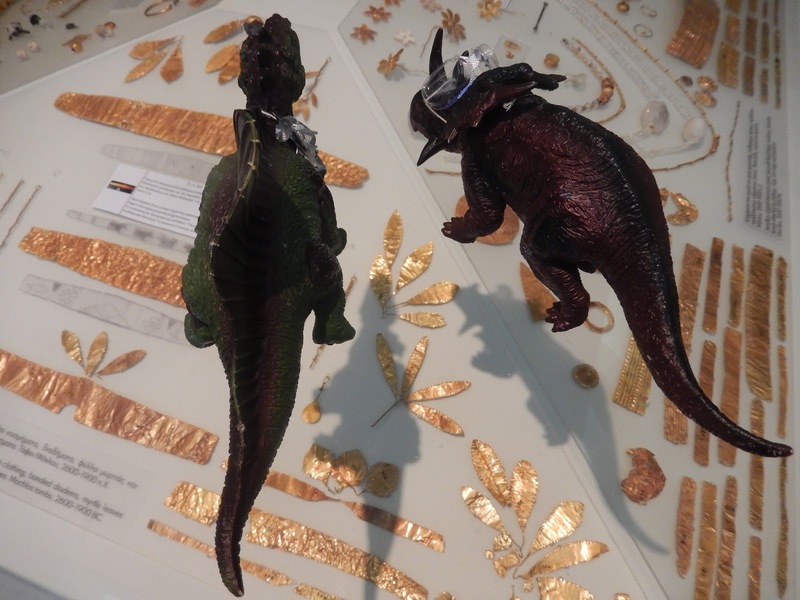 This was an opportunity to shop for jewelry, and for dinosaurs. 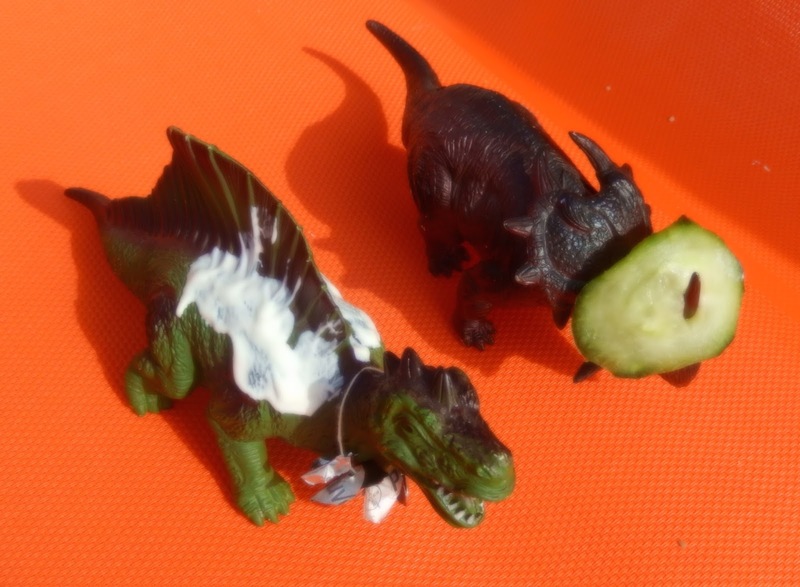 Yes, dinosaurs. Raki in the morning might have put us in a silly mood. 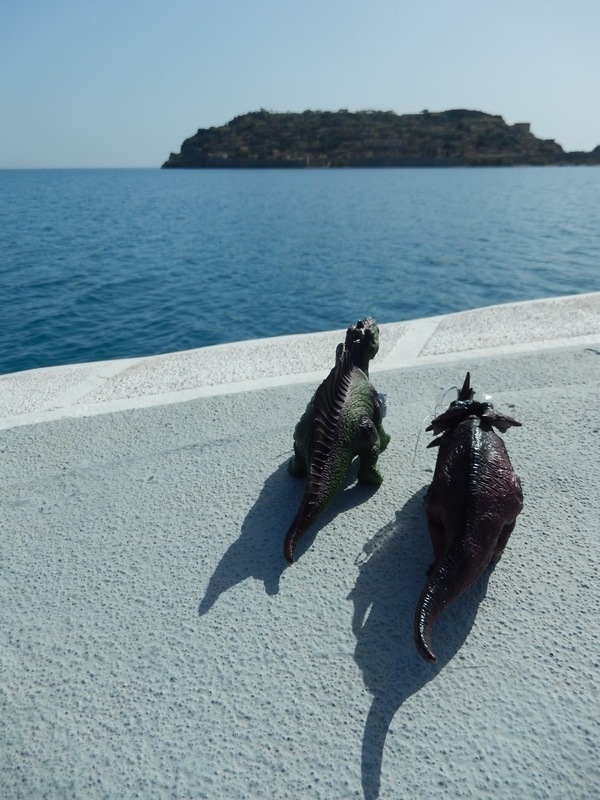 During our Cretan stay last year, our colleague, Terry, had jokingly pleaded to change our itinerary so that we could go to "Dinosauria" so we decided to tell him that this year we had visited the place. 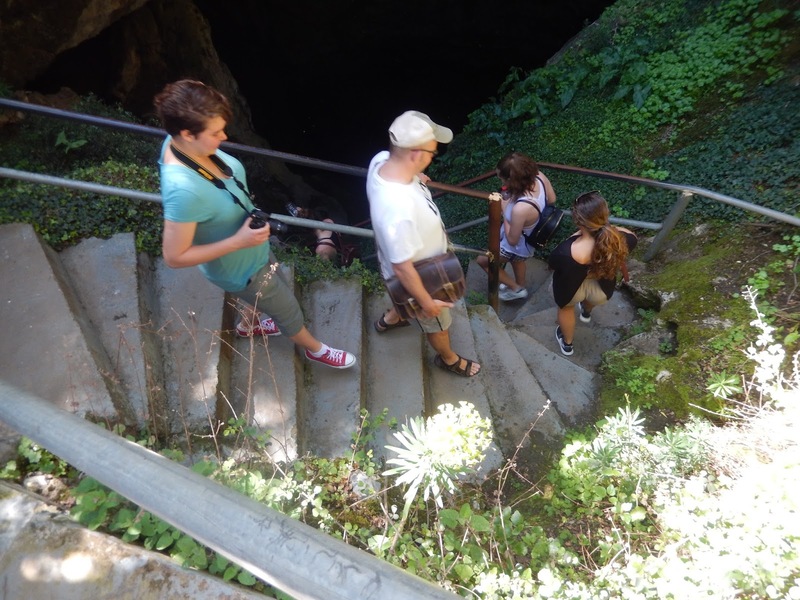 He was not with us this year, opting instead to travel to Portugal on a service trip with some of our students. 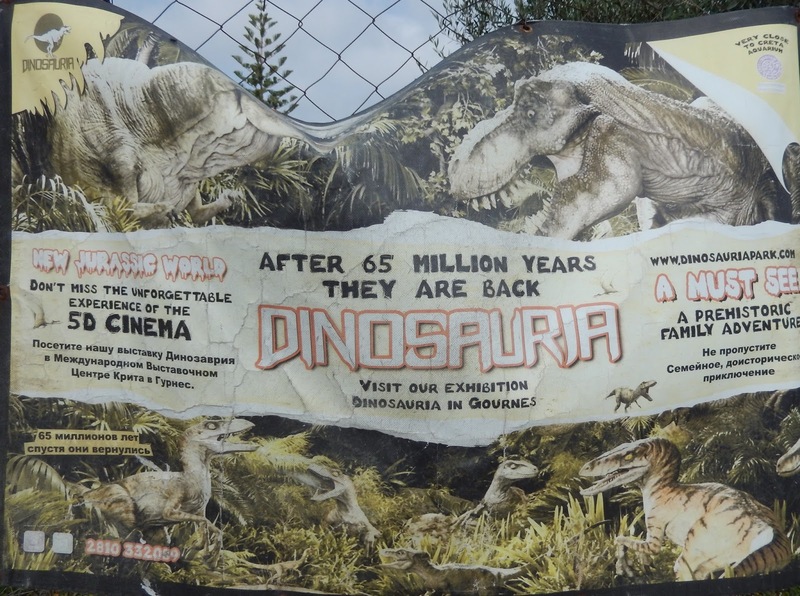 Poster for Dinosauria. 5D Cinema!! 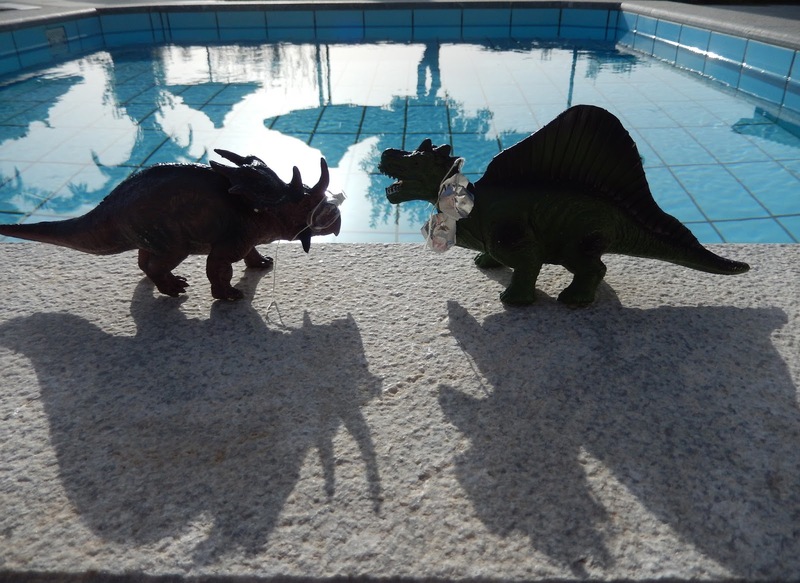 After Patti dubbed the two plastic dinosaurs, Terry and Reynolds, we spent a lot of our time on the island setting up photo shoots for them. The legend of Terry and Reynolds was born, with Patti, the source of outrageous ideas, Louise, the wardrobe mistress, and me, the cameraman and writer of their adventures. The students thought we had lost our minds! Terry and Reynolds by the pool. Note the goggles and necklace fashioned by Louise. 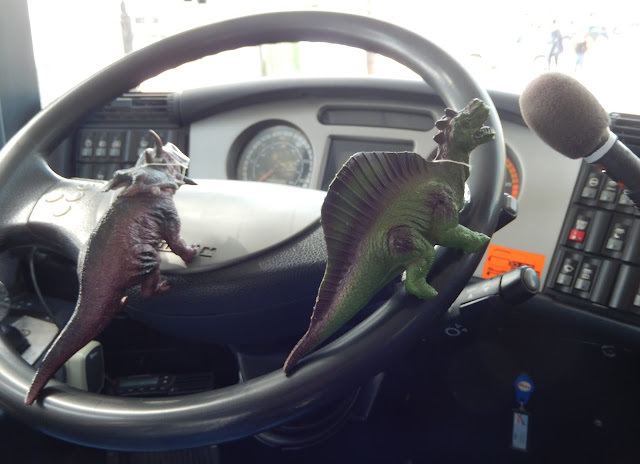 Terry and Reynolds commandeer the bus. On our second day on Crete, we headed to Spinalonga, an island that was once a leper colony, and before that, a Venetian fortress, with Terry and Reynolds as bus driver and tour guide. They also sat in the stern of the boat as we crossed the water. What a cheeky pair! 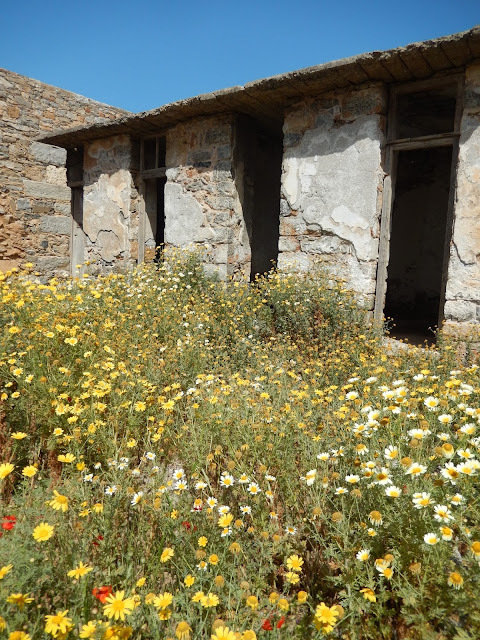 I love Spinalonga's bleak setting, especially in the spring when the wildflowers are in full bloom. 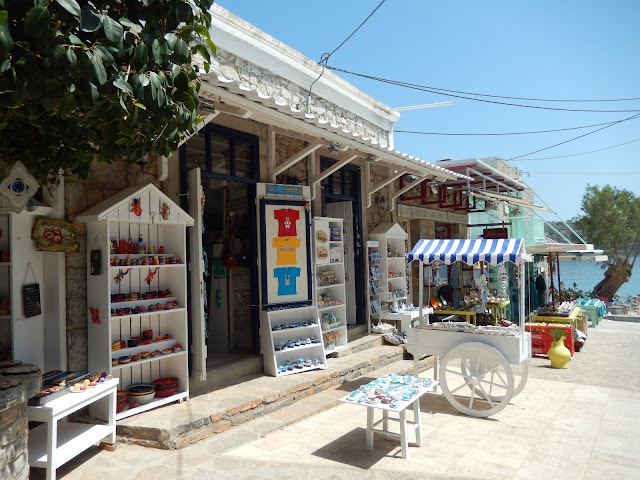 I am also partial to the small row of shops that greet visitors before and after they make the crossing. While last year we were told we had no time to visit them, this year, our guide gave us half an hour to shop. Hence, many of us helped the local economy. 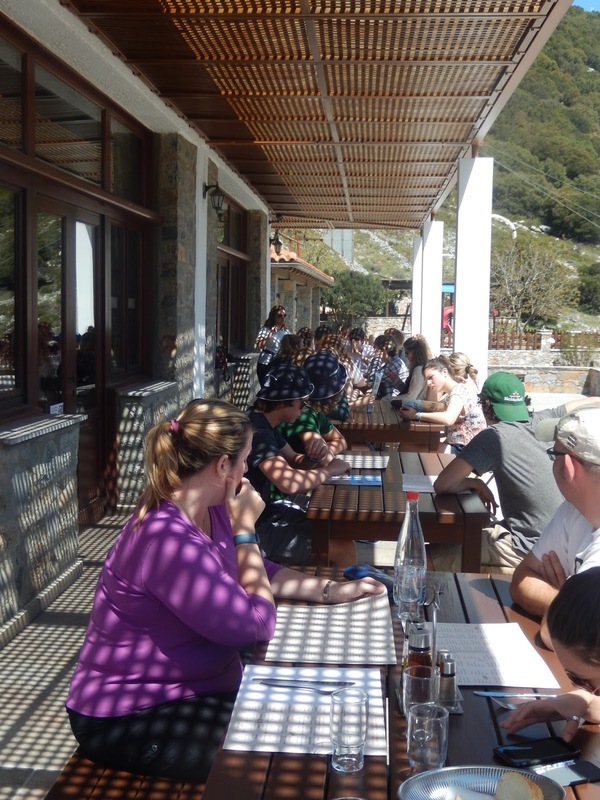 From there, we headed to Agios Nikolaus for lunch. This is another shopping mecca which we had visited last year. Looking for new vistas, Louise and I found time to see the beach area before returning to the bus. The next day we headed to an area that we had not visited previously, the Lasithi Plateau in the east of the island, where we would descend into the Diktaion Andron, a cave that, according to local legend, was the birthplace of Zeus. 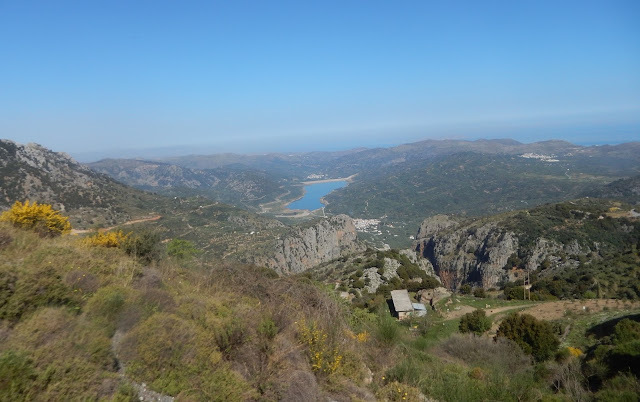 To get there, we climbed to an altitude of 840 meters above sea level on winding roads. There were many spectacular views along the way. Here I am with the plateau behind me. 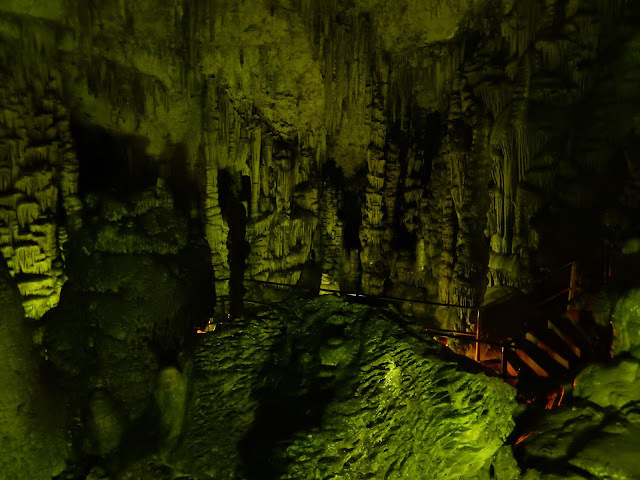 The cave itself was quite large and well lit. Stairs led into its depths and then, on another route, up again. It took about 15 minutes to walk the entire circuit. 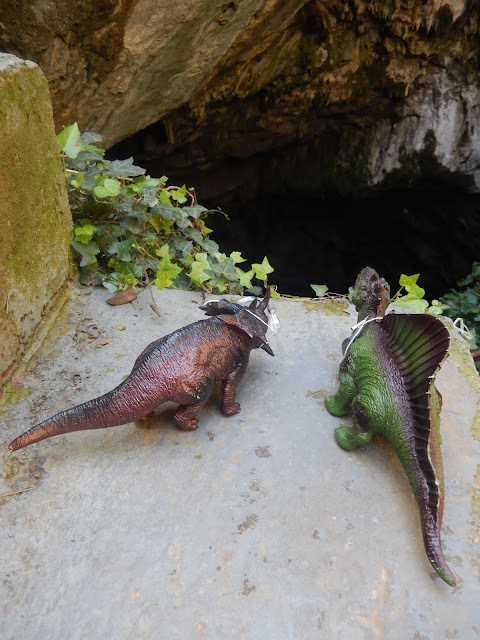 Terry and Reynolds opted not to descend into the cave. 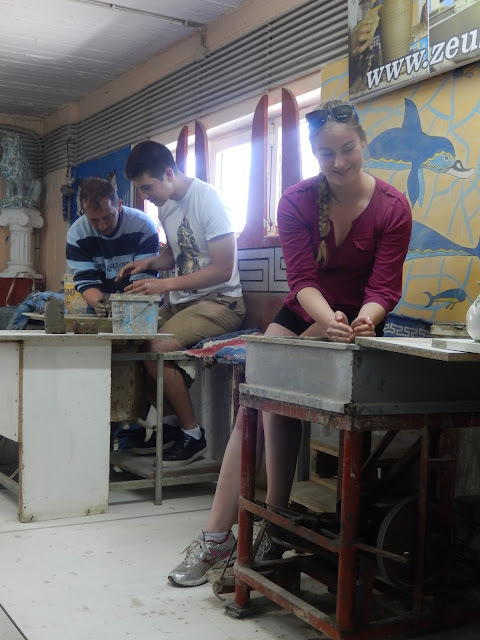 I enjoyed the fresh air on the plateau and the visit to a family pottery shop nearby. 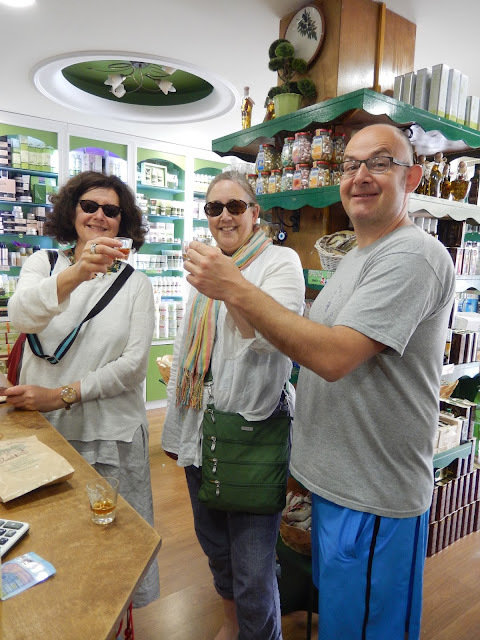 Here, we sampled Cretan olive oil and Cretan honey, while a lucky few learned how to fashion a pot on the wheel. 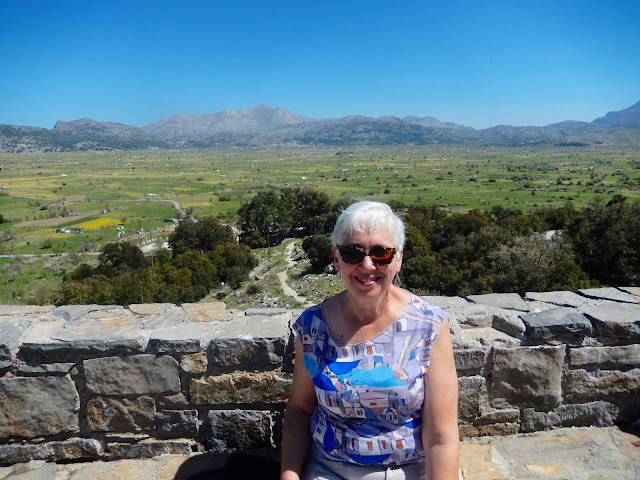 Nearby, over lunch, I enjoyed a delicious moussaka, made with locally grown ingredients. Yummy! Dining outside on a lovely day. On reflection, this was a enjoyable day, although it could not quite measure up to the trip to Santorini we took last year. (That option was not possible this year, since the high-speed hydrofoil was not yet in service.) Still, I am glad to have visited the heights of Crete. With a late start planned the next morning, there was time for a beach wedding. 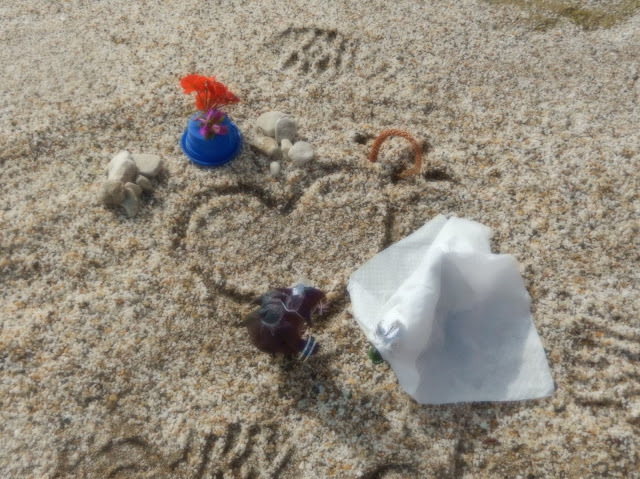 After some time at the spa, Terry and Reynolds declared their love for each other by the water. Yes, the teachers lost their marbles while on Crete. 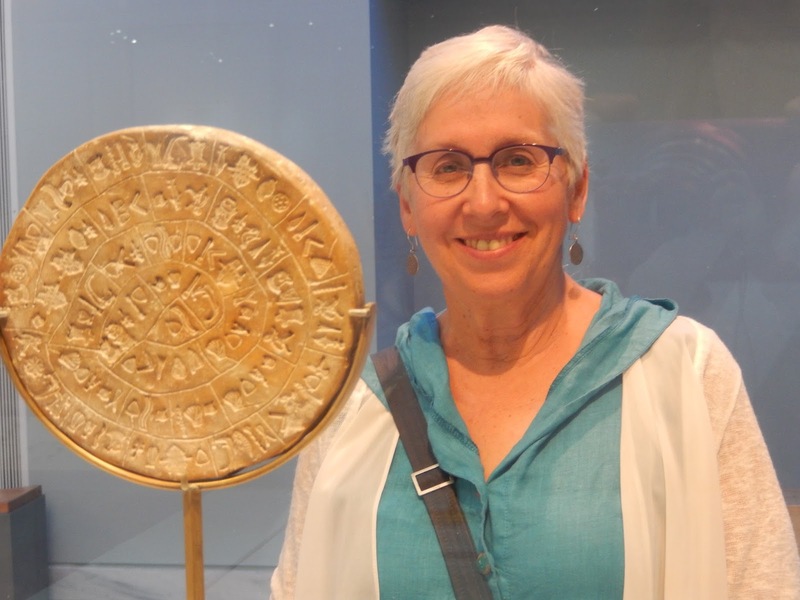 This ancient Minoan artifact was the inspiration for my earrings which I bought in Crete last year. 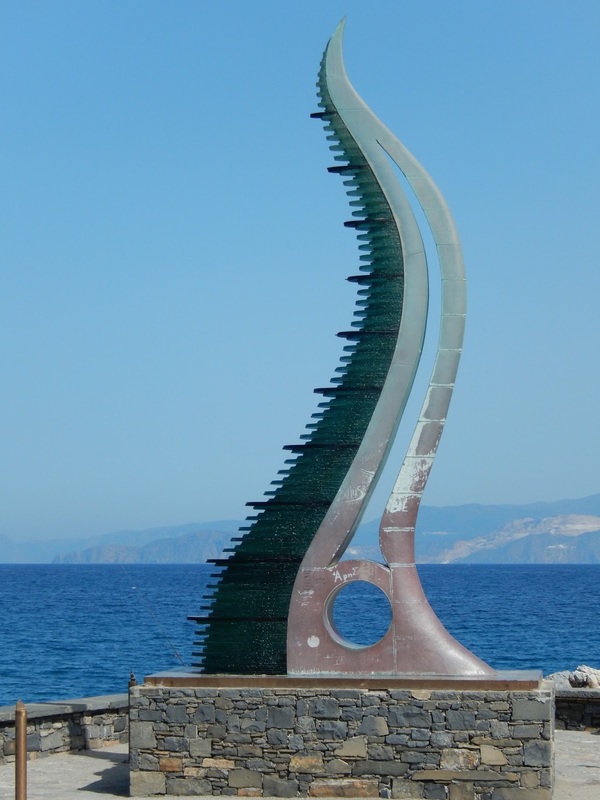 Our final afternoon in Crete took us back to Heraklion, the capital, where the ferry had docked a few days prior. We spent our day learning about the Minoan culture that existed on the island 4000 years ago. 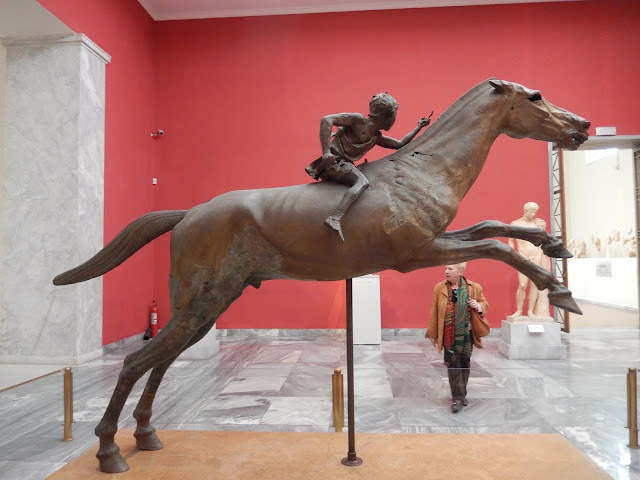 We first visited the Archaeological Museum where fascinating artifacts tell the story of this very advanced civilization. 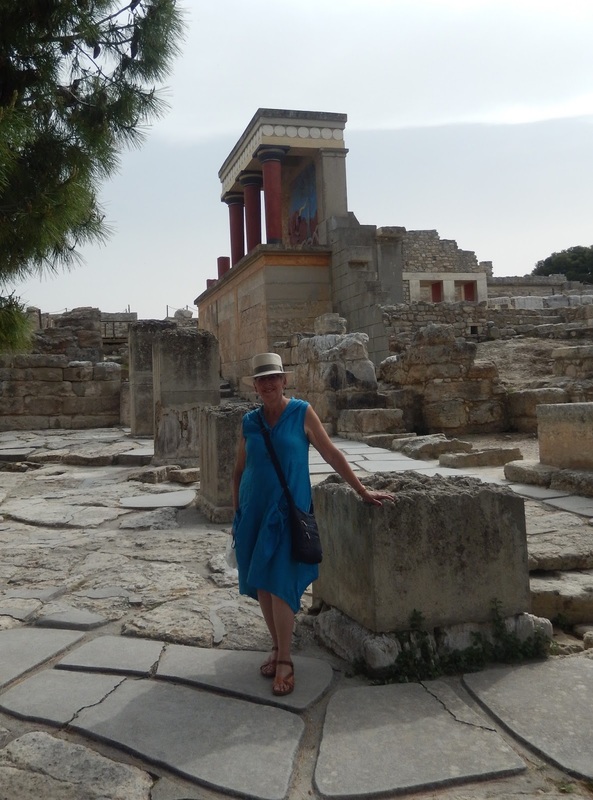 On the grounds of the Palace of Knossos. 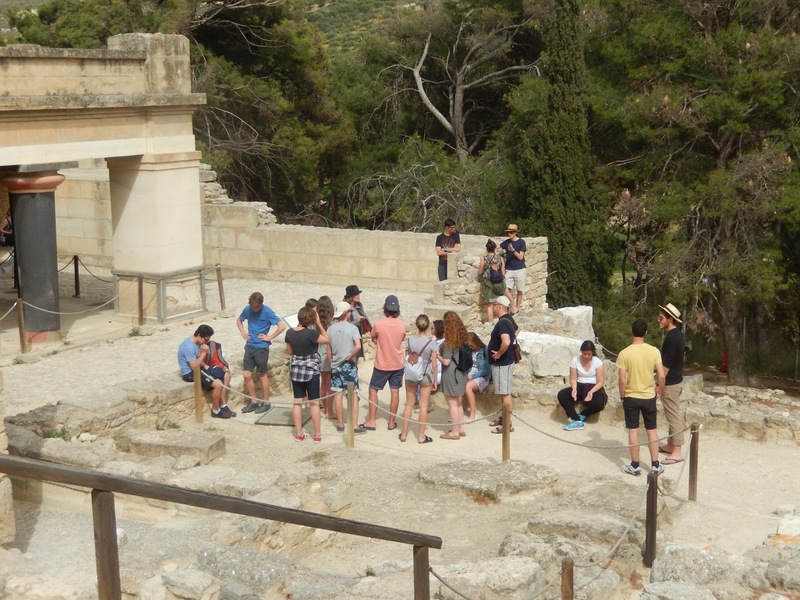 Next, we travelled a few kilometres away to the Palace of Knossos, a partially rebuilt archaeological site. 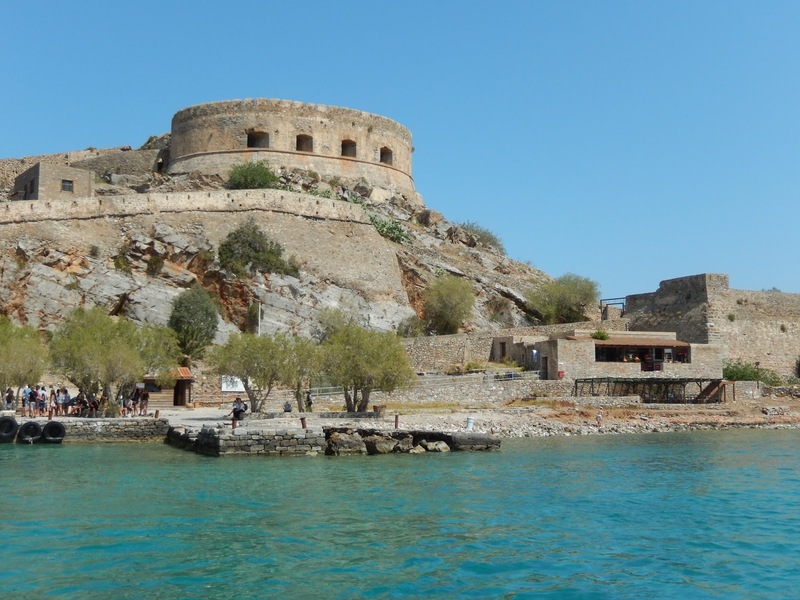 It is considered Europe's oldest city, having been inhabited during the bronze age. Thanks to the work of English archaeologist, Sir Arthur Evans, it tells a compelling story of Minoan culture, a culture that predates the Ancient Greeks who populated Athens. 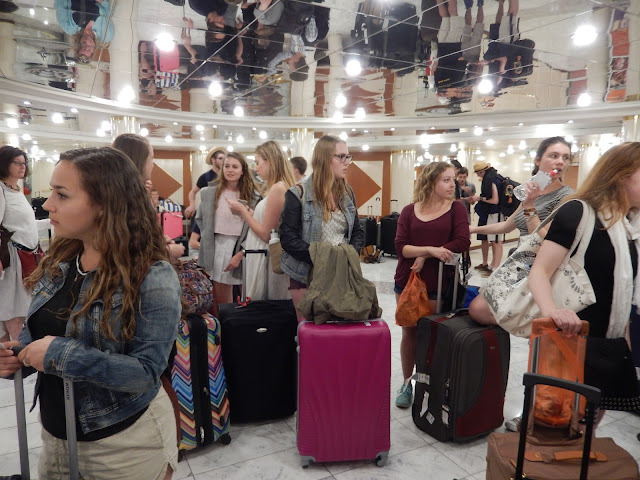 By evening, after another delectable Greek meal, we were back aboard the ferry on our way to the mainland. 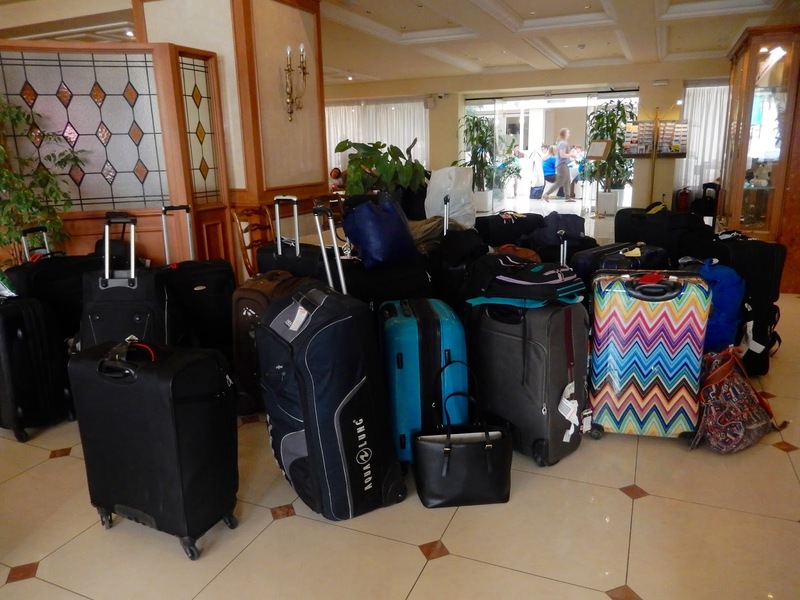 This time, we were advised to get a good night's sleep, since we would start a tour upon arrival in the morning. Our guides met us at the harbour and off we went to the Acropolis Museum for a few hours. That was our last tour of the trip. The staff enjoy lunch in Plaka. The remainder of the day was free to explore and shop in Plaka, Athens' tourist area, or if needed, to rest at the hotel. I certainly appreciated the leisurely pace at the end of a very hectic two weeks, but I still wanted to see as much as I could. 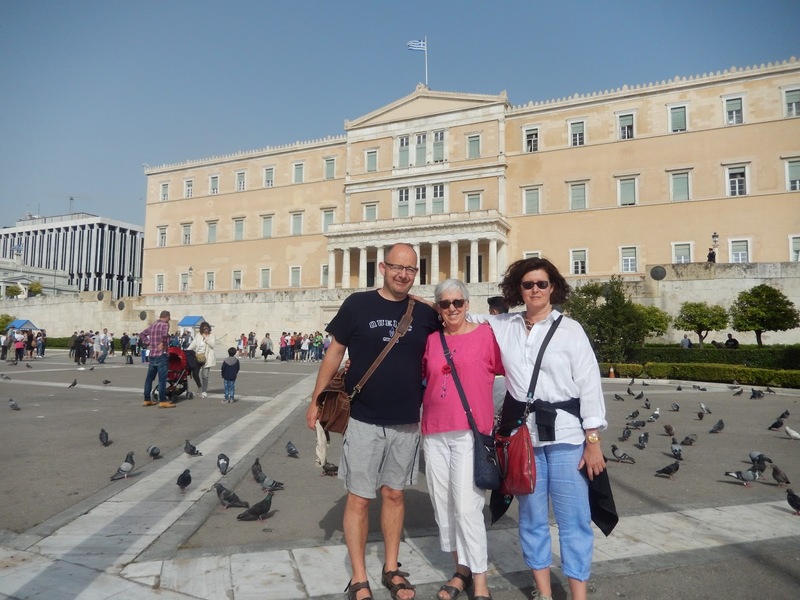 Adam, Louise and I at the Greek Parliament. In the late afternoon, Louise, Adam and I managed to make it to the Greek Parliament building to see the changing of the guard. This was very entertaining. The spectacle reminded me of the Monty Python sketch: the Ministry of Silly Walks. I mean no disrespect, but it was outrageous to watch these men in tights and skirts point their toes (with pompoms on their shoes) and swing their arms rather wildly. 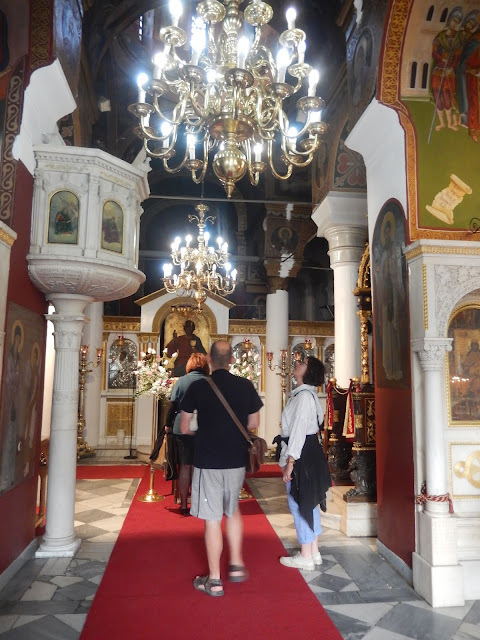 Before we met the group for dinner, we also entered a couple of Greek Orthodox churches, most notable the Ayia Aykaterini. It was very interesting. 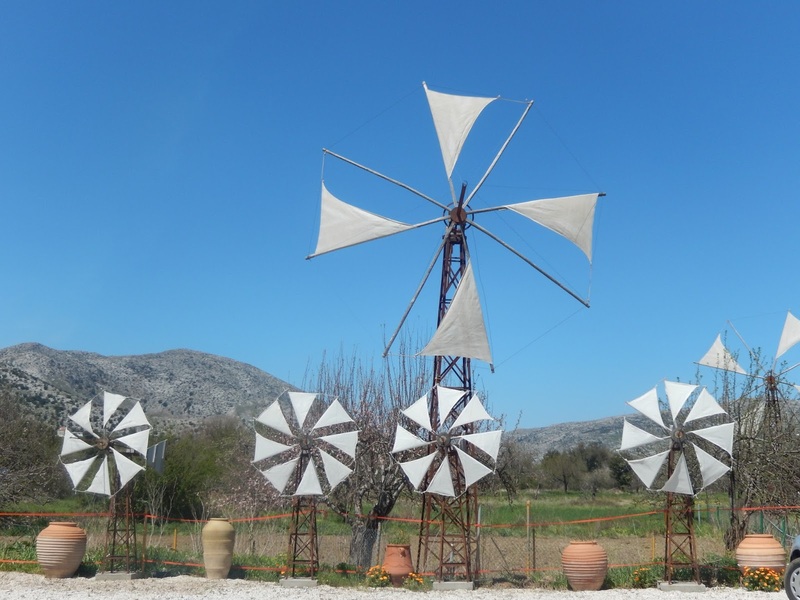 That evening, we dined as a group in a taverna, serenaded by folk music and entertained by local dancers. It was a fitting end to our Easter break. As for Terry and Reynolds, they started a family on the ferry and were never heard from again. 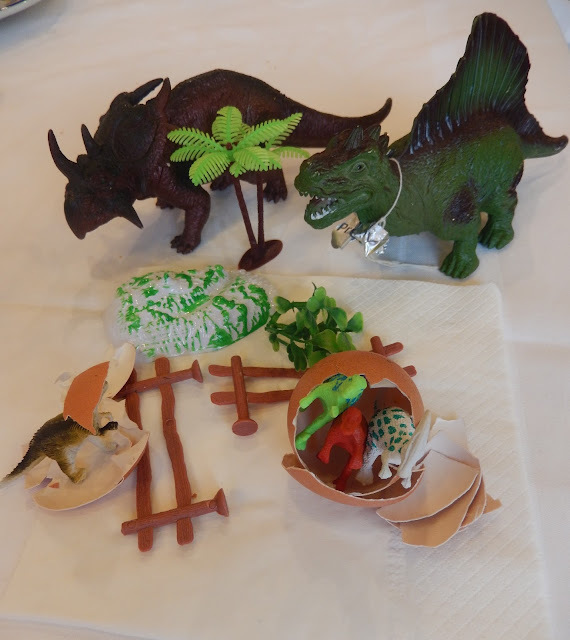 Baby dinosaurs hatching with Terry and Reynolds looking on.